Thank you everyone for your kind comments and purrs for Buddy - they have warmed my heart and helped me hang on in the time of unknowing. Thank you, thank you!! Since my Wednesday schedule was light and I wasn't feeling all that great, I decided to work from home for a little bit. 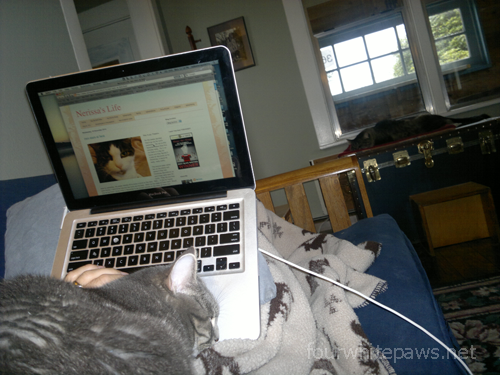 Willow decided she would assist me in my work. 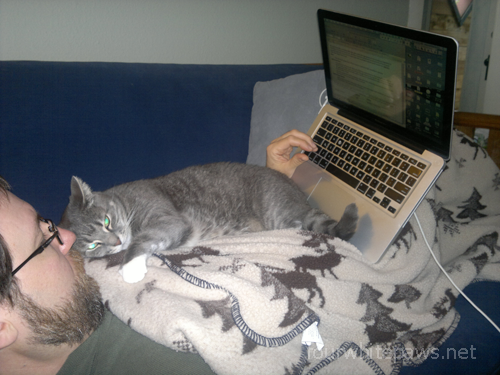 Even though she zonked out on the job, the purrs never stopped. 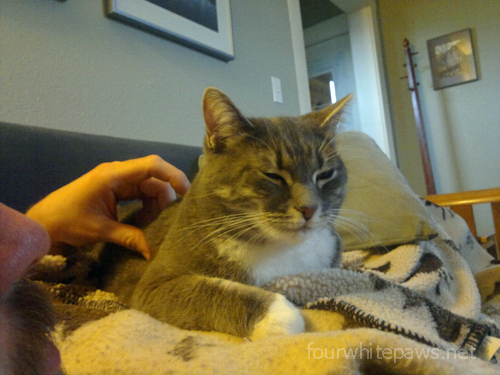 Everyday Willow gets more affectionate. After over an hour of Willow's hard work, I had to get up so I could take Buddy to the cardiologist. Willow wasn't happy about ending her work day so early, but she managed. The cardiologist's office is a good distance away, so I left really early and thus got there early. Buddy got to hang out with me in the car as we waited. He doesn't get frightened by unfamiliar space (or much of anything for that matter). 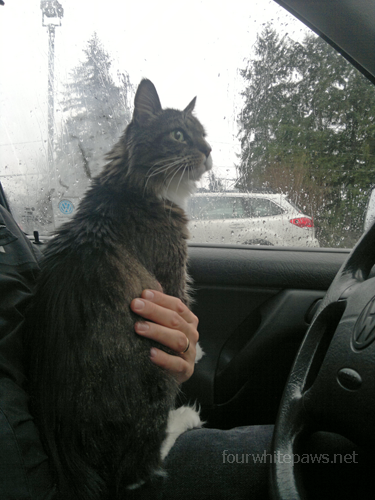 So, he was happy to get to leave his carrier and explore the car while we waited. Then the time came to meet with the cardiologist, Dr. Woodfield. He explained to me how things were going to go and then we got down to business. He first listened to Buddy's heart. Then came time to look at Buddy's heart using the magic probe. I'm thrilled that he didn't need to shave Buddy's soft tummy furs. 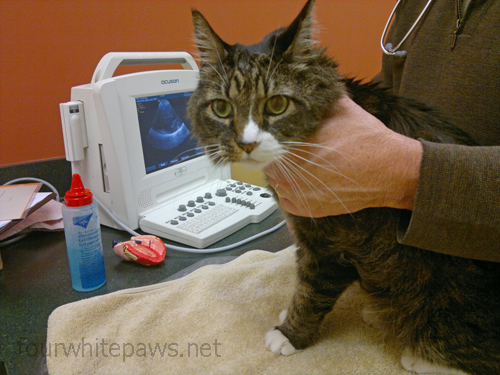 My regular vet always shaves off a bunch of furs to do an ultrasound. Maybe the extra schooling required to become a cardiologist teaches them how to work the ultrasound over the furs?! Maybe next time I'll request for my vet not to shave and see what happens. The results showed that Buddy's heart is in good shape. He doesn't suspect heart disease but believes the murmur is coming from old age. 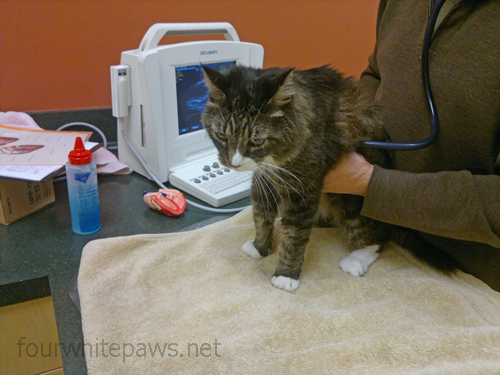 Apparently, it's not all that uncommon for older cats to develop a murmur as the heart ages. I'm so happy to hear this news! We don't need to do anything unless something changes in his vitals or his symptoms! Yahoo!!! I really liked this vet, in fact, I liked him a lot. He's really down to earth and there is no hidden magic. I loved that he did the exam and ultrasound with me helping out. I got to be there to hold Buddy and comfort him, although, I'm not sure he needed any comforting, he was more curious and not the least bit frightened. As the cardiologist worked the ultrasound, he explained to me what he was seeing, which was quite different than what I saw. He saw various chambers of the heart and flowing blood, I saw psychedelic abstract art in motion. I learned Dr. Woodfield's wife, Dr. Wilford, was the founder of Feral Cat Spay/Neuter Project (our local amazing low-cost, high volume cat spay/neuter clinic). How awesome is that!! 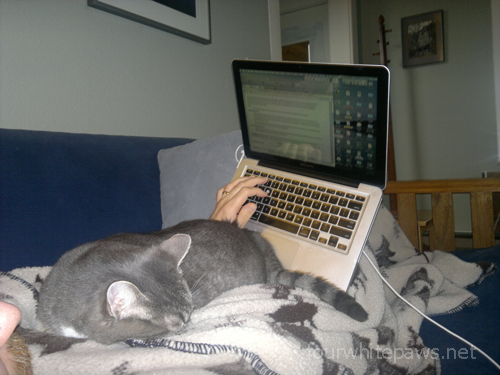 She's since moved on to do TNR advocacy on a nationwide level and is assisting with TNR research. Full disclosure: the last two pictures of Buddy getting examined were a reenactment. Dr. Woodfield graciously cooperated with reenacting the exciting parts of the examination for the sake of you, all my devoted blog followers. Even though the actions occurring in these images were staged, the images on the ultrasound screen are authentic. Thank you again everyone for your purrs and kind words. You all are an amazingly awesome community, thank you. So glad to hear the good news! Way to go, Buddy! We're so happy Buddy's heart is fine that we're feeling all leaky eyed at the moment. Okay, our human is. She could well imagine your stress and anxiety, and hope that this good news eases your mind and that you have a GOOD day. Purrs and smooches to Buddy, what a good mancat he is! Yay for Buddy! So relieved and what an awesome vet. Charlie has a slight heart murmur and we also think it's from old age. So happy for you guys! Such terrific news so pardon us while we happy dance! and i adore the reenactment. Dr. Woodfield is very kind and generous to take the time for you to take some photos. I'm so glad that it is good news and you can stop worrying so much. I am glad you found such a kind, caring vet. That is great that shaving wasn' t needed and you could help. I am sure you feel much better now knowing Buddy's heart looked good. I will pray for him to have continued good health. What a great vet you found! It's so great when human or animal doctors give you extra time and interest. We're glad you found a good vet! That can be tough, especially with serious issues like heart. Great news for Buddy and you! Glad to hear Buddy's heart problem is just as mine is - old age murmur. It's not easy getting old (my Mom agrees with that statement..haha). But one thing is that as long as it's not heart disease, we're "good to go" even with a little murmur!! Glad you got good news....this is a time of the year for GOOD news not sad news............sending you big hugs of "happy" ! Yesterday, it would not allow me to comment for some reason but today, I say how grateful I am that all is well after all for Buddy. And when Willow comes to help I know you are thrilled. I would be as well. I'm so happy to hear about Buddy!!! What a sweet guy, he's so brave! Pawsome news! 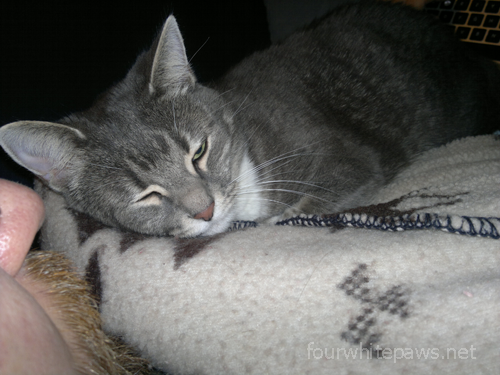 Skootch has had a heart murmur ever since he was a kitten, and it hasn't slowed him down.